In a game of tight margins, Lutonian made 176, with the medium-pace of Matt Pateman (4-38) and Shoaib Rashid (4-28) proving most effective at the Hardy Vale. The Otters looked down and out in the run-chase at 71-7, but a partnership of 76 between Joe Bygraves and Rob Taylor (24) gave them a chance. Bygraves added 24 for the last wicket with Rashid, but the last man was caught with two balls left and Flitwick four runs short. Liam Peters inspired Flitwick II’s second victory of the Division Three campaign with an excellent unbeaten 76 at Eversholt II. Peters knocked off the closing runs with Akmal Qamar (28 not out) in their ninth-wicket partnership to see them to a target of 194. Earlier, the Boars made their way to 193-6, with Robert Timms taking 2-32. Stuart Warren starred with an unbeaten 65 and Luke Smith added 41 as Flitwick III put up a competitive 190-5 against Great Brickhill II in Division Five. But, Smith aside, the Otters’ bowling lacked accuracy and Brickhill made the target inside 33 overs with seven wickets down. Flitwick’s first XI suffered a second defeat to local rivals Ampthill in the space of four days on Saturday. Following their defeat in the quarter-finals of the Heritage Cup on Wednesday, Flitwick went to Ampthill Park searching for a second win of the Saracens Herts League Championship season. They did quite well with the bat, George Thurstance leading the way with 92 off 86 balls, and late runs from Robert Taylor (20) and Al Mahmud Hasan (23) seeing the Otters set a target of 220. After two early breakthroughs, however, the A’s put the hammer down in a partnership of 95 between Bryan Lewin (58) and Nick Barden (48), before James Gage’s late unbeaten 23 carried them over the line by two wickets. Nadeera Nawela captured 5-60 with his off-spin. 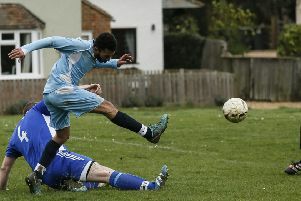 Flitwick II got back to winning ways in Division Three B, bowling Luton Town & Indians II out for just 96 at the Vale. Pateman led the way with 5-11 and Nathan Wing chipped in with 2-29. Michael Bodo (46 not out) and Steven Davies (27 not out) knocked off the runs for the loss of just one wicket. A strong Flitwick III team swept aside 10-man Harpenden IV at Southill Park for their fourth win out of six, in Division Eight A.
Timms bounced back to batting form with 105, sharing a second-wicket partnership of 180 with Ben Barzilay (91). The Otters’ 270-5 was more than sufficient. Akmal Qamar continued his successful season with 4-31, and Nathaniel Spedding (2-37) and Stephen Allen (3-19) chipped in as the visitors were rolled for 104. This Saturday in the Herts Championship, Flitwick host Hemel Hempstead, the IIs go to Southgate Adelaide and the IIIs have a top-of-the-table clash at Potten End. In the Beds League on Sunday, both Flitwick firsts and IIs take on opposition from Ampthill.